Ok, its not perfect, but I recon its not bad for the first attempt…. We hosted our Annual Burns Supper supperclub at the weekend. We had 17 guests joining us for dinner and 11 of them are French. They wanted to taste ‘THE Haggis’ ….. The French guests were coming along to celebrate the head of the family’s birthday (60th) and as such I was been asked to create a birthday cake for the end of the meal. I was of course happy to oblige (any excuse for me to bake). 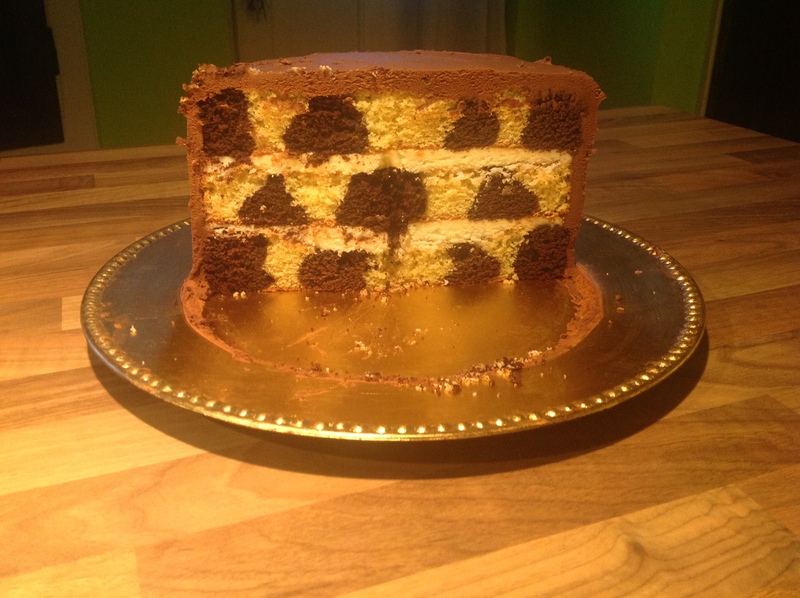 I had a look through a couple of my recipe books and a look on the internet, and I decided on a Chess cake, ‘if it works, it will look amazing, I just need to make sure it tastes amazing too’. On the outset this looks a difficult/complicated cake to make, but once you realise that it is only 3 sponge cakes that you need to make and then the filling and icing, it should take away some of the panic…. 2 x piping bags with 1.5 cm plain tube, if you don’t have piping bags and/or tubes, you can put the mixture into large food bags and cut the point off when you are ready to use them, just make sure they are the same size of opening. Weigh your mixing bowl before you start, you need this when you need to split the mixture into separate bowls. Put the butter into a large mixing bowl and using an electric hand whisk, start to whisk until the butter is thick and creamy. Gradually add in the sugar and orange extract. Keep beating until the mixture is lighter in colour and a nice fluffy texture. Gradually add the eggs a tablespoon at a time, and ensure it is completely combined before adding the next tablespoon. Add a tablespoon of flour after each tablespoon of egg to ensure the mixture doesn’t curdle. If it looks like it is going to curdle, add more flour and just mix in, it will all come together. Sift in the remaining flour and salt into the bowl and fold in the flour, ensuring all the flour is incorporated into the butter egg mixture. Take half of the mixture (measure it out, weigh the total weight of your bowl with the mixture and subtract the weight of your bowl) and place in another mixing bowl. Sift in the cocoa powder and add 3 tablespoons of milk, and fold into the sponge mix until all combined. Place this into one of the piping/food bags. Add the remaining 2 tablespoons of milk to the plain sponge mix and fold in until all combined. Place into the other piping/food bag. 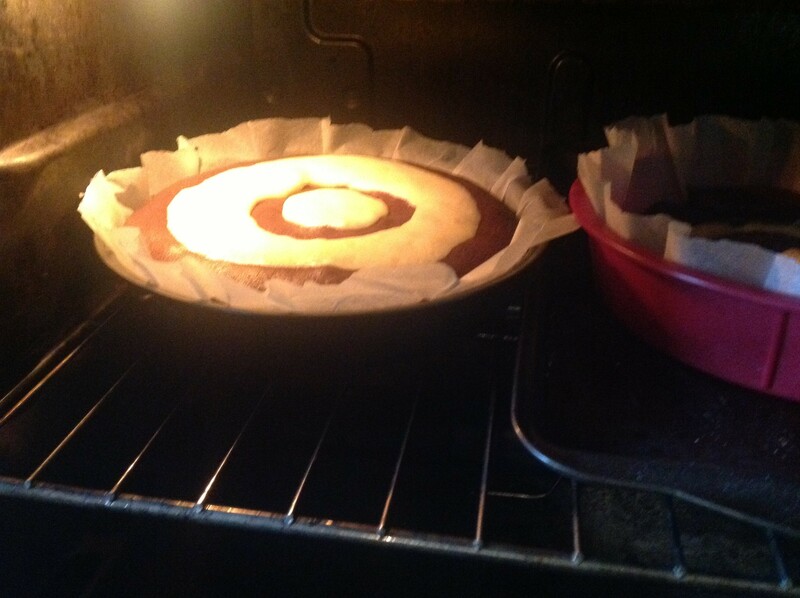 Take the sponge tins, pipe a ring of chocolate mixture around the inside edge of one tin, completing a full circle. Then pipe a ring of the orange mixture inside the chocolate ring and continue until the tin is full. Repeat this process for the second tin. For the third tin, start the outer edge with the orange mixture and then the chocolate mixture, so you have the opposite of the first two tins. Bake in the oven for 20 mins until well risen and springs back to the touch. Check with a wooden toothpick to ensure there are no wet crumbs on the stick. Take the sponges out of the tins and leave on a cooling rack to cool completely. Put the soft butter into a mixing blow and beat with an electric mixer until paler in colour and very creamy. Sift the icing sugar into the bowl. Add the mil and the orange extract. Beat on a low speed until smooth and thick. Set aside until ready to use, it is better to leave out of the fridge as you will need it to spread on the sponge cake. Pour the whipping cream in to a small pot and place on the heat. Warm the cream, but do not bring to the boil. Break the chocolate into smallish pieces and place in a mixing bowl. Pour the warm cream over the chocolate pieces and allow to melt. Mix gently to ensure the cream and chocolate are fully combined and glossy. You will need to allow the chocolate mixture to cool for 1-2 hours (depending on the temperature of your kitchen), then take a hand mixer and whisk the chocolate mixture until you achieve the consistency you are looking for, it should be a thick chocolate spread, it will set more in the fridge late. 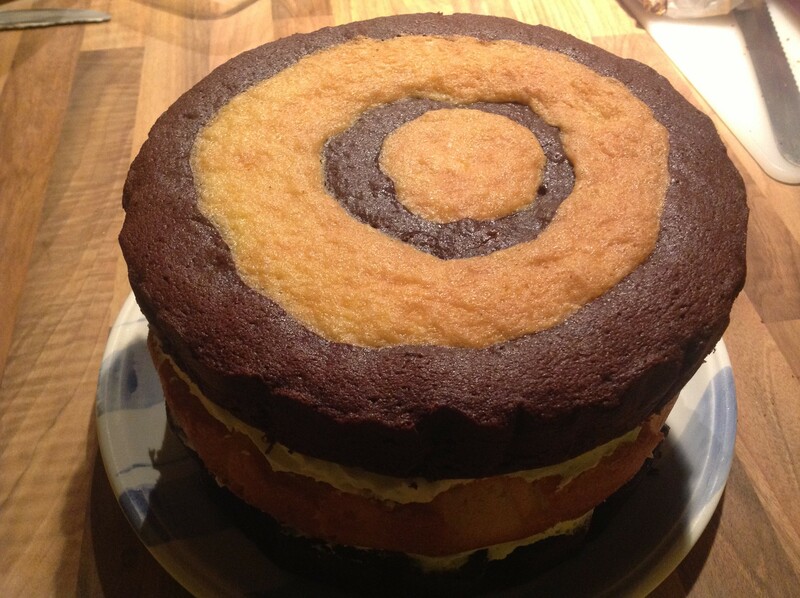 Take one of the sponge cakes with chocolate on the outer edge. Place on your serving plate. Take the orange butter icing and work 1/2 of the mixture over the top of the first sponge. 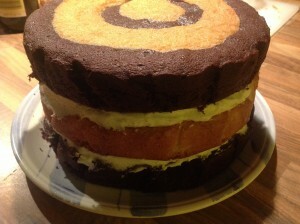 Take the sponge with the orange outer edge and place on top of the butter icing, building the second layer of the cake, top this sponge with the remaining 1/2 of the orange butter icing and then top with the final layer of sponge. 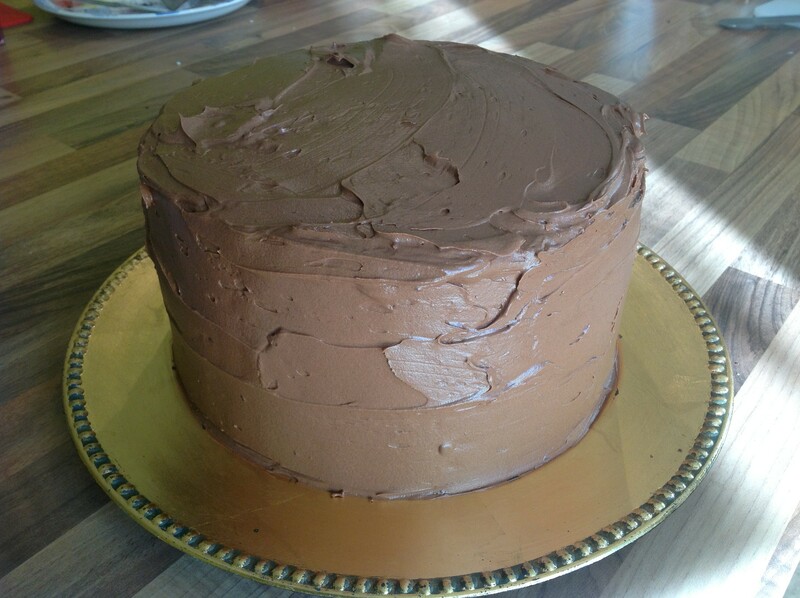 Place the fridge for 30 mins to help the cake to settle as it will be easier to apply the chocolate ganache. Take the chocolate ganache and cover the top and sides of the cake, ensuring the layers are completely covered. Set aside for the ganache to set (not in the ridge). I will be decorating with candles and cake sparklers, you can decorate with chocolate shards or sprinkles, let your imagination run riot……. WOW it looks as good as I hoped.